Welcome to the 23rd day of this Blogging Marathon. As I mentioned in my previous post, this BM is helping me to get back to some of my forgotten recipes. This is the second recipe that I am preparing after a long time like the enchilada casserole. Don’t ask me why I didn’t do this earlier. Even I don’t have the answer. 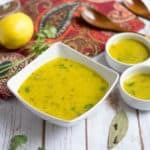 ;-) Coming back to this recipe, this is a simple recipe with no tadka and no dry powders. 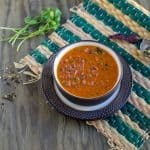 You can also use dry masala powders but I prefer the sauces instead of dry masalas. 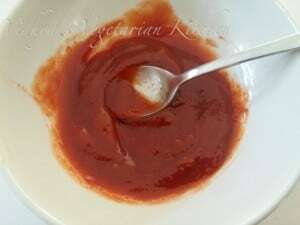 Its a four ingredient fix and all you need is cauliflower (of course), tomato ketchup, red chili or schezwan salt and some sugar and thats optional too. No salt is required for this dish. The sodium content in the ketchup gives you the required amount but always adjust these sauces according to your choices. 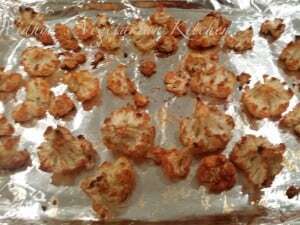 Pre heat the oven to 350 degree F.
Clean the cauliflower and break them into small florets. 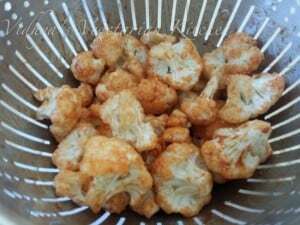 Bake the cauliflower for 10 minutes. While the baking is happening, mix the ketchup, schezwan sauce and brown sugar nicely. 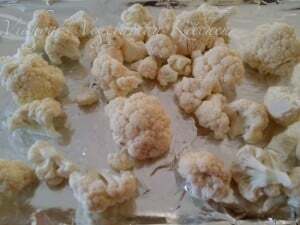 Remove the cauliflower from the oven after 10 minutes and once its easy to handle and add the mixed sauce and rub well. Then bake it again for 25-30 minutes till they turn light brown and crisp. Thats it sweet and sour and spicy cauliflower is ready. This goes well with fried rice or noodles or even with roti. 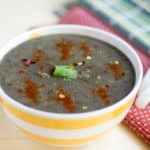 A very interesting and good recipe. 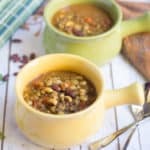 Interesting recipe!! Sure kids will love !! Very interesting and innovative bake with cauliflower. Sounds delicious. 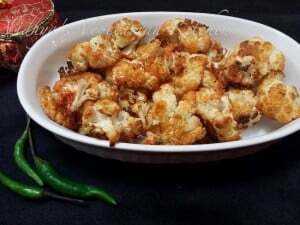 Healthy and delicious cauliflower, love the flavor too. Such a delicious snack!…good that you remembered this again! Must say this is a very interesting recipe, very innovative and the flavors sound just perfect…really very good. Using ketchup as the sauce for baking is new to me. Very innovative. It looks great Sri…Guess I will try without sugar!! Awesome dish for fried rice…. Oh yeah sugar is optional dan pa.. Yup its perfect with fried rice. Am sure this baked cauliflower will definitely tickle the tastebuds.. Just drooling here..
Don’t know if my previous comment got posted. Try posting from my mobile. this is my kind of a dish. I would prefer just the spicy part & leave out the sweet. Nice recipe. Yeah sugar is completely optional Usha. Thanks Kristen and Welcome here. Hi! I just wanted to let you know that I’ve nominated you for the Liebster Blog Award because I love your recipes and blog!!! I’ve been following your post for a while now and love your work. Thanks a ton. You made my day. Will take it for sure. Thanks again and welcome to my space. You deserve the recognition. Thanks for taking up the challenge. I can’t wait to read your answers.